This Venezuelan reliever and an obscure outfielder from the late 1950’s named Herb Plews are the only two players we could find on the Red Sox All-Time roster who were born on Flag Day. Luis Eduardo Yuripe Aponte was signed by Boston in 1973. He spent the next four years trying to make it up the ladder of the Red Sox farm system but couldn’t, so he “retired.” But instead of quitting all together, this right-hander began pitching in the Inter-American League where he developed a new pitch in the form of a very effective fork ball. That fork ball not only got him re-signed by Boston, it got him to the Major Leagues. After two short but successful trials with the parent club in 1980 and ’81, Aponte became a regular part of manager, Ralph Houk’s Red Sox bullpen in ’82 and ’83. He appeared in 40 games during his first full season in the big leagues, going 2-2 with 3 saves. He then went 5-4 in 1983 with 3 more saves and a decent 3.63 ERA. 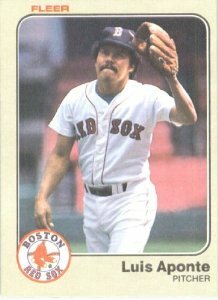 His Red Sox career ended during the 1984 spring training season, when he was traded to Cleveland for two minor leaguers. After pitching in 25 games for the Indians that year, his big league career was over. He eventually became a scout for the Cleveland organization. Aponte was born in El Tigre, Venezuela in 1953.